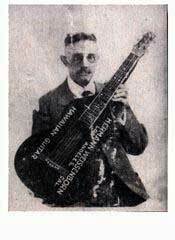 Hermann Weissenborn spent the early 20th century making some very excellent hollow neck guitars and Hawaiian ukuleles in his workshop in Los Angeles after emigrating from Germany to New York in 1902, and he would have probably been astonished to know that almost a hundred years later collectors would pay a premium for his Hawaiian style guitars. I know this because I googled his name last night, after stumbling over a solitary, unique slide in a collection of architectural photos of the Bay Area. 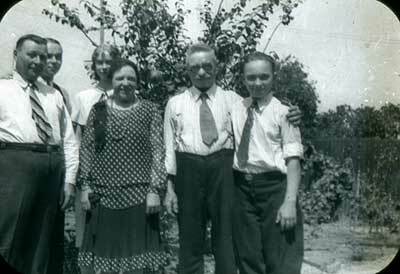 The slide is labeled in neat, very small handwriting: "Mr. Hermann Weissenborn, his daughter Meta and Mr. Albert and grandsons Edwin and Robert and me Thelma. Visiting us at 311 East 25th Street New York from L.A. California." Now judging from the clothes these people wear, this looks like a shot taken before the Second World War, maybe around 1930. The guitar maker Mr Weissenborn died in 1936, so that would fit. And how many Hermann Weissenborns could there possibly have been in Los Angeles at that time?